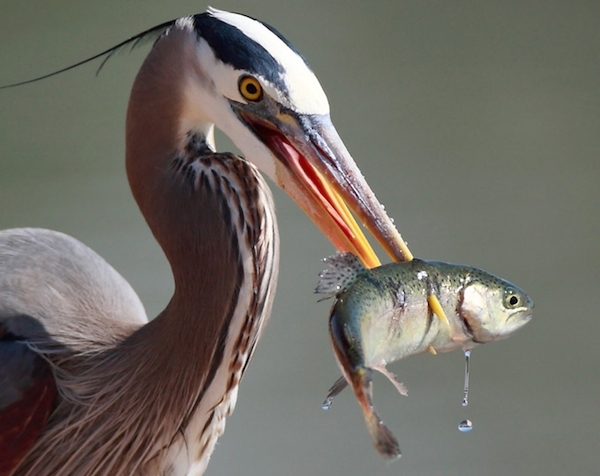 ”Great Blue Heron With Fish,” by Linh Dinh. EUGENE Oregon—(Weekly Hubris)—9/29/2014—A few evenings ago around dusk, I looked up and saw a Great Blue Heron in silhouette (well, even when they’re not technically “in silhouette,” G.B. herons look that way, since their qualifying blue is so dark and old it hardly qualifies as a color at all anymore. The bird itself is so ancient and regal that its name is probably placed into the modern “blue” spectrum as a courtesy; what we call its color is more like an immortalized patina reeking out from some vast realm between the feathers and bones where a whole lot of hanky-panky evolution took place that never got into the books), chugging across the horizon towards his lonely night resting place. These incredibly noble birds are huge in comparison to, say, robins and blue jays and even crows or most hawks—but they don’t command the jaw-dropping attention of golden eagles, magnificent frigatebirds, or storks. Still, even though they’re fairly common in most parts of the US, I will go to my death not ceasing to do a double take of awe and deep joy whenever I see one. In this case, at this time, a word rolled down the marble-chute of my idle brain: Grandfather. And I stuck out my lower lip as I squinted into the pale sky from which the sun had just withdrawn all its color flags, and watched the almost ungainly progress of the bird into the place where I could no longer recognize its shape. He was Grandfather partly because the bird had no idea that’s what he was. His enormous innocence went along with him like an invisible cloak that had been made larger and larger and larger until it was very like a map of the world as big as the world. But his world. The Great Blue Heron world. He is a bird and very firmly so. But not primarily. Here my jaw did begin to drop. Yes, this heron is “Grandfather”; I can feel it in his particular silhouette, in his age, in his indifference, and most of all in what he knows that we also know but don’t know that we know. He carries this knowledge with him everywhere. Perhaps this is why he flies so ponderously and slowly and with such archetypal authority that it makes you almost turn inside out when you see him. 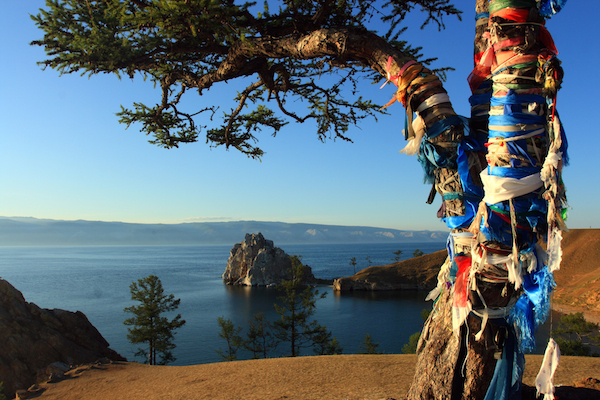 Shaman Tree on the shore of Lake Baikal, in southeastern Siberia. This, I understand, was something like the way I was receiving the spirit and personhood of that single heron crossing a strip of sky on a recent evening. Or, perhaps, that recent heron crossing a single sky on a strip of evening. Note: The quotation comes from page 268 of Piers Vitebsky’s book The Reindeer People: Living with Animals and Spirits in Siberia (New York: Houghton Mifflin, 2005). Illustrations: The first image above, “Great Blue Heron with Fish,” by Linh Dinh, derives from http://wordlesstech.com/2010/11/30/great-blue-heron-with-fish/; the second image above, of the Shaman Tree on Lake Baikal, derives from http://ladaray.wordpress.com/2013/11/23/writing-bliss-siberian-shaman-and-legend-of-the-bear-drum/. 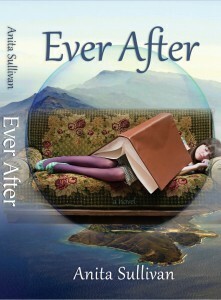 Ever After: A Novel Kindle Edition by Anita Sullivan. Born under the sign of Libra, Anita Sullivan cheerfully admits to a life governed by issues of balance and harmony. 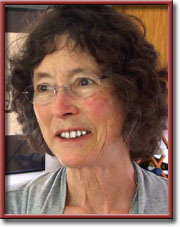 This likely led to her 25-year career as a piano tuner, as well as her love of birds (Libra is an air sign), and love of gardening, music and fine literature (beauty). She spent years trying to decide if she was a piano tuner who wrote poetry, or a poet who tuned pianos. She traveled a lot without giving way to a strong urge to become a nomad; taught without becoming a teacher; danced without becoming a dancer; and fell totally in love with the high desert country of the Southwest, and then never managed to stay there. However, Sullivan did firmly settle the writing question–yes, it turns out she is a writer, but not fixed into any one category. She has published two essay collections, a novel, two chapbooks and one full-length book of poetry, and many short pieces in journals. Most recently she published Ever After, a novel that takes place after life but before death, mostly on the Greek island of Ikaria. Every incident in the book happened to her in a slightly different form: she always writes from direct experience. Even more recently (November 2016) Sullivan published a chapbook of poems, And If The Dead Do Dream. True to her Libra roots, it has a theme of parallel worlds. has a whole chapter of its own, as does love of beautiful food (which you honor so well in your own writing).